Let's start off with a mint Parker True Blue set (the later year 'Streamline' models) colours definitely a tribute to the Parker quality and may I add in their original box. Lots of flex in the gold nib and no flaws in either the fittings or finish on pen or pencil. To cut to the chase, Chris is offering this impressive set for $400, which I think is a very good and responsible price. 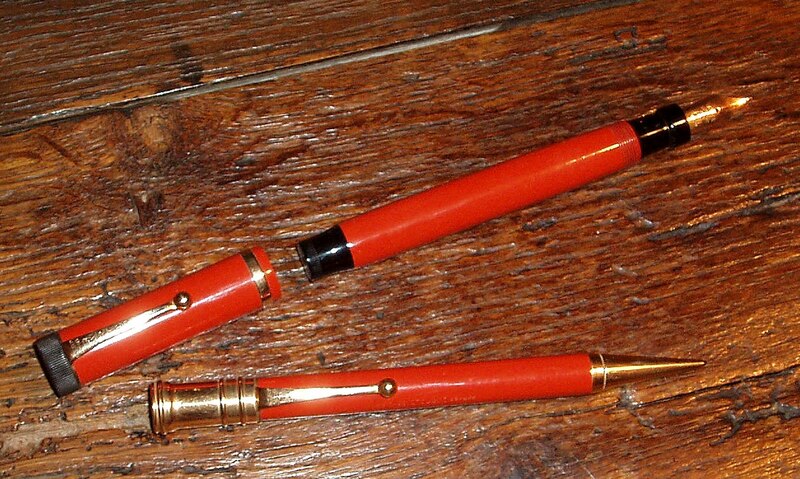 Round two, involves a mint Big Red Parker set, from the late 1920s. 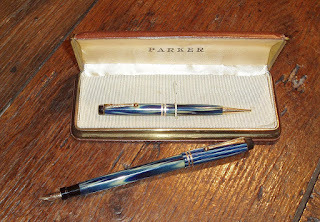 Both pen and pencil are mint and well imprinted with the Lucky Curve designation. The nib on the fountain is big as is the pen, sitting on a Christmas tree feed, and talk about a beautiful writer, this pen takes the cake. The flex in the nib is the best I have ever written with. It is just a joy to use. 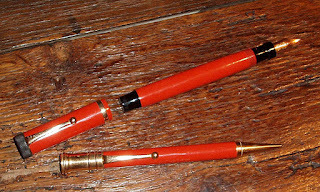 Pen measures 6.75 inches posted and is totally restored. It draws ink like a Trojan and has a lovely even flow. Chris is selling this set for $500. Round three is a mint Parker Mandarin Yellow Duofold Jr. also Lucky Curve designated and this pen is both flawless and writes impressively. 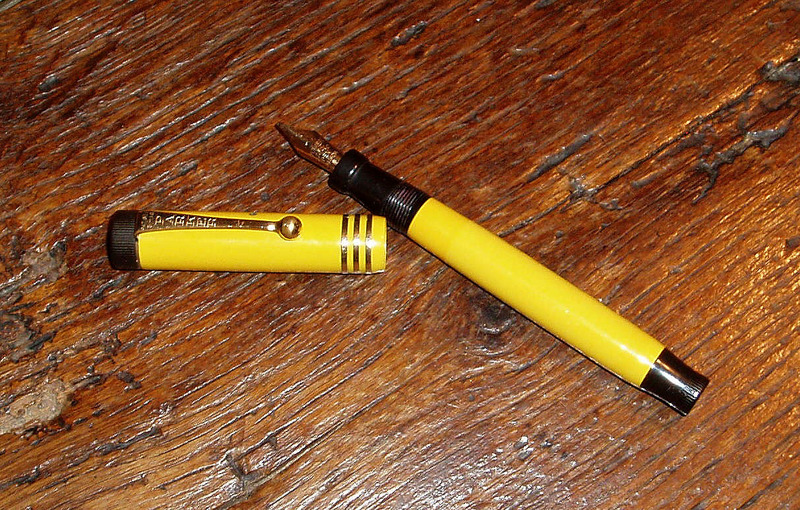 Once again, lots of flex in the beautiful gold nib and it has a 3 gold cap rings and a brilliant yellow finish. Chris is selling this beauty for $325. 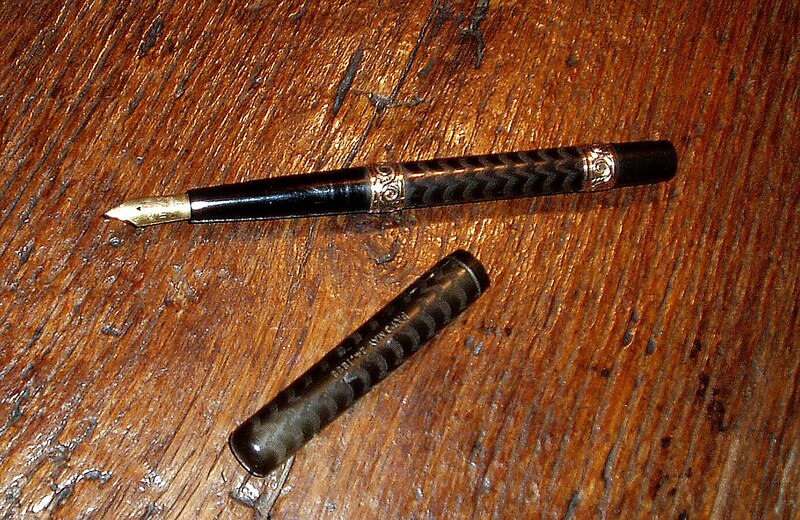 Finally, she is selling a lovely early Waterman's 13 chased hard rubber eyedropper, also in mint condition with two wide brilliant gold overlay barrel bands. The 14K gold nib which also has lots of flex is a number two and the pen measures all of 6.75 inches posted. I inked this pen yesterday and used it to write in my journal. Definitely a lovely pen to write with, with a even smooth flow. Chris is selling this flawless beauty for $225.